Quick late evening post. The GFS and CMC model runs have come in (I really should post a glossary!) and both are pretty direct hits on Birkieland. 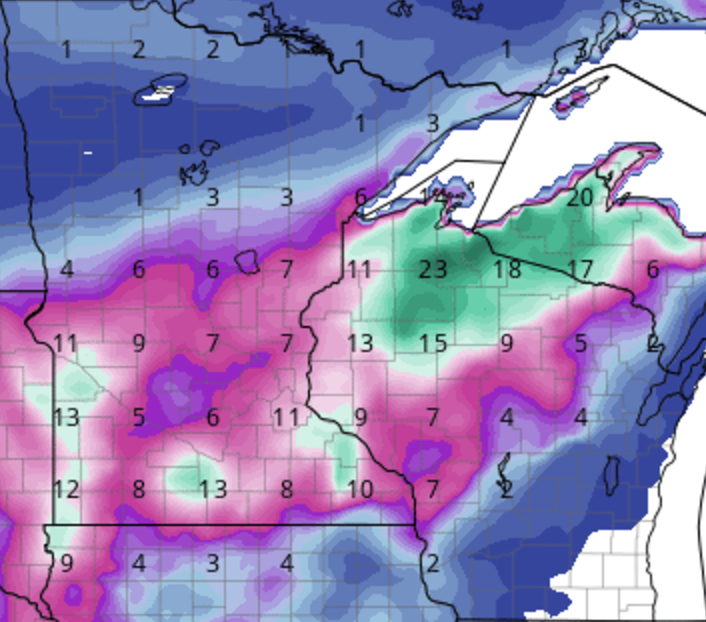 The GFS is kind of perfect, it starts snow on Thursday evening and drops nearly two feet by Saturday morning. The Canadian is a bit later and a bit lighter, but still puts down nearly a foot by Birkie o’clock. Based on this, and how confident Ben Popp is of the base in our podcast, I’m lowering the proprietary-calculation cancelation number to 30%. Yesterday we calculated the odds of a Birkie full cancelation at 20%. However, the most recent model runs have not been great, so I’m bumping the odds of a canceled Birkie to 26%. Basically, I’m keeping other odds equal (odds of the snow not melting, the snow melting south of OO, and the course being too bare to ski) but pulling the chance of a snowstorm saving out skin down to 33%: or one in three. It seems we’ll have to thread the needle. To continue with yesterday’s football analogy: think about this as kicking a 50 yard field goal. There are basically four things—other than a block—that could happen. The kick could sail through the uprights: that’s the foot of snow on Friday. It could go wide left, which would be the storm going too far north and it raining in Hayward. Or it could go wide right, and the storm could miss the northland all together. Or it could fall short, which would be the storm taking longer to get to Hayward and not delivering snow in time. Several of the most recent model runs have been short and left. The European model actually improved: 8″ of snow on Friday morning (so a nice kick through the uprights). But the Canadian and American models both shifted north and slowed down, meaning a sloppy Friday and maybe some snow on Friday night. That would be iffy for a race. But nothing is set in stone. Yesterday, the models, if they were missing, were shaded right. So this may be a trend, or there may be some reversion to the mean coming up. We’re still a week away from the race, so we have several more model runs to hope that our storm will save us. Or we may see it move or disappear, a potential coup de grâce for our hopes of a tenth straight full-course Birkie. The one thing that poor weather is good for? BirkieGuide.com site visits. The past two days have been the busiest days on this site in February in its history. So, thanks for reading, I guess. We know it’s going to get warm. The GFS model puts the high temperatures for the next six days at 47, 48, 49, 53, 55, 44; the Euro at 46, 46, 48, 46, 52, 36. Both hint at some rain on Monday. None of this is good: this is enough heat to eat away at the snow base, which is already below average (if there were two feet of snow, it would be fine, but there isn’t). The base may survive. It may not. This is really hard to forecast. Slight differences in cloud cover at different times of day, for instance, can make a big difference. This is really a “hope for the best” type of situation. 8″ of snow by 7 a.m. on Saturday. Not the best we’ve seen, but we’d take it. So what does this mean? It means the Birkie could be canceled. I won’t sugarcoat that. Here is my current prediction. First, I’d say there’s a 50% chance this storm materializes and we get enough snow next Friday that it doesn’t really matter if some hills burn out because there’s 6+ inches of new snow to ski on. That would be nice. This is a really high percentage guess for a storm, but it’s rare to see such consistency on the models. If the storm doesn’t materialize, I’d say there’s about a 20% chance that enough snow survives to ski a full course. Another 10% that the course might have to be ended or turned at OO (and I have no idea what this would mean for the Kortelopet). And a 20% chance the race is canceled. You never want to place so many of your eggs in the basket of “I hope model runs seven days out verify.” This is very risky business. But that’s where we are right now. Our second-best hope is that the upcoming thaw doesn’t melt the trail. And our best hope is for a last-second miracle snowstorm. It’s going to be warm in the next week. Real warm. Mid-40s warm. If there was two feet of base, it would be less of a concern, but snowfall has been somewhat low this year in the Northwoods, and this is the kind of heat which could burn down some south-facing hills to grass. Grass is not good for skiing. Right now, depending on which model you trust, we’re looking at four or five days in the 40s, potentially topping 50˚ on one or two. The saving grace may be that it won’t rain, which can quickly erode the base: dew points should stay low enough that snow loss will be mostly by sublimation, and the base and ground may keep too much from melting. (It also minimizes runoff which could make the ice on Lake Hayward unsafe.) The other possibility is that various models have hinted at a snow storm at the end of this warm period the Thursday or Friday before the Birkie, which would freshen up any base there*. But we don’t want to rely on hoping for a snowstorm a week out. There’s also significantly more snow on the northern half of the trail than the southern half, and it’s possible that the trail will be skiable north of OO and not to the south. The new Classic trail gives the option of turning the race back at OO and finishing it in Cable, although this would be operationally difficult, it may be an option. We’d certainly miss out on the Hayward finish, but if it’s not skiable and the ice isn’t safe. 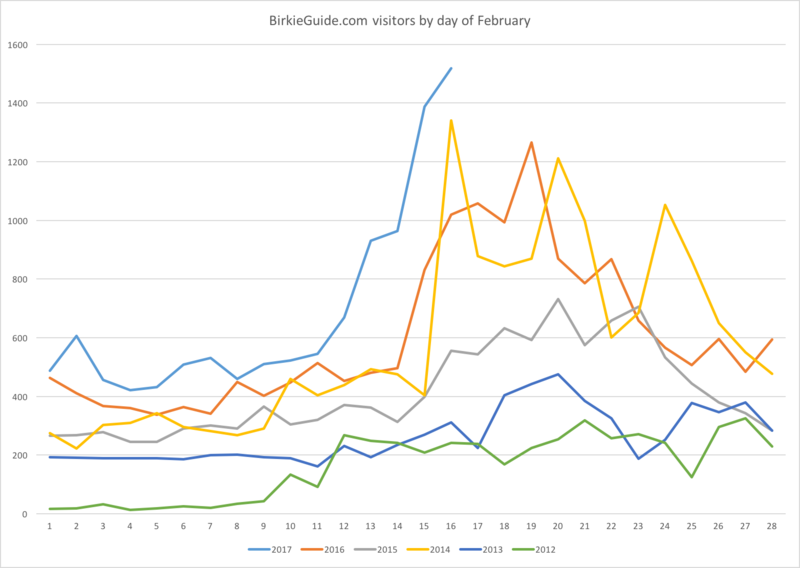 We’ve had a good run of Birkies: the last time there was this much uncertainty for the Birkie was in 2007. We may have that sort of issue: enough snow north of OO, and not south. Or we may have an 2012 scenario: dry ground in Spooner, but perfect conditions on the trail. It’s wait and see time, though, and hopefully we’ll be skiing down Main Street in 10 days. No news is not good news. No news is me not posting. I’ll keep it short: it’s going to get warm in Wisconsin next week. Maybe in to the 50s. Maybe some rain. It should cool down by the Birkie, but the base is going to get hit hard. The lake might as well. Cross your fingers it doesn’t. But it doesn’t look very promising right now. The past couple of post have been a bit vague about how bad the threat of a huge warm-up looked, because I wanted to hedge my bets and not be a huge Debbie Downer. And, as often happens in long range weather speculation (there’s a reason I don’t say “forecast” here), things have changed. Luckily for the better (also known as “reverting to the mean”). Now that the threat seems to be ebbing, here’s what I saw, what I’m seeing, and what it might mean. Here’s what we saw about a week ago. 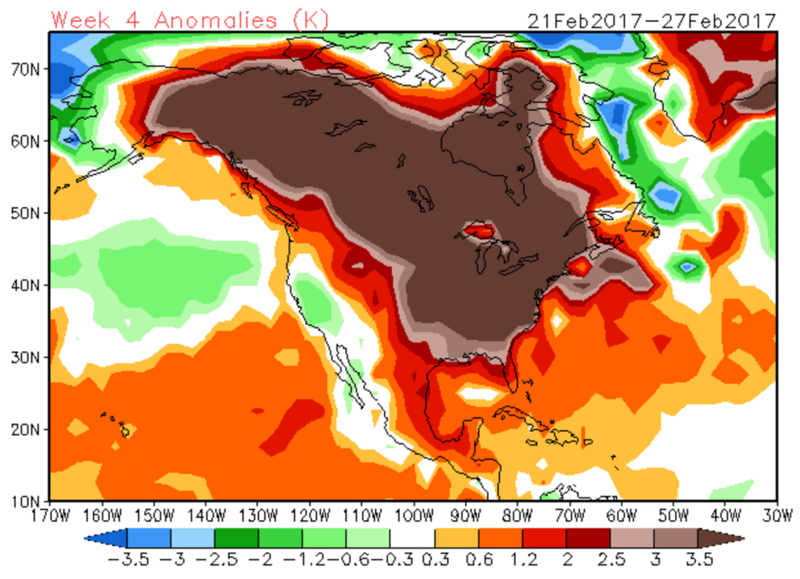 This was the four week extended model at that point showed a large positive temperature anomaly stretched across the continent: the kind of temperatures which would lead to 40˚ temperatures in the northwoods which could eat away at the base. (See the map at right.) The weather models didn’t look much better, with temperatures looking to take a week-long ride above freezing. This persisted for a few days, but recent maps have looked a lot better. We’re still looking at some positive temperature anomalies, but not to the same extent. The shorter-range models do show some warming temperatures this week and next, but staying in the 30s, with little liquid precipitation and the chance for some snow. And the week of the Birkie itself looks cooler, so we shouldn’t have a repeat of last year. All this, of course, can and will change. There’s very little skill predicting the temperature out beyond a few days, and anything past a week is generally just looking at trends. Still, I’d much rather have trends point to normal temperatures than way above. Weather Speculation: Is the trend our friend? Last week, we wrote about how the long-range weather forecast for the Birkie was sub-optimal. Since then, it hasn’t gotten much better, but it hasn’t gotten any worse, and there are some glimmers of hope. Looking out 10 to 16 days on the models is always a dangerous exercise, and we should look only at bigger picture trends, not specific events. The US model, which goes out to 16 days, is promising. The last few runs have dampened the western ridge somewhat, and kept Wisconsin on the eastern fringe of it, keeping temperatures from skyrocketing in to the 40s. The European Model out to 10 days mostly does the same. The US model even shows some additional snowfall before race day. It’s still a low-confidence forecast, and there’s plenty which could go awry, but for now decent snow conditions appear possible. Early Weather Speculation: Snow, then Warm, then ? It’s February, so it’s time for some early Weather Speculation posts on BirkieGuide.com. Last year, you may remember that it was warm for the Birkie. There was plenty of snow, but the race took place in the middle of a thaw, leading to somewhat sloppy conditions. This year, a similar pattern is setting up, but it might come earlier, and the race may be cooler, but since it’s more than three weeks away, there’s not that much that we know. Right now, snow depth in Birkieland is about a foot. It’s a good base, but it’s far less than we’d like at this juncture. That may change, soon, for the better. 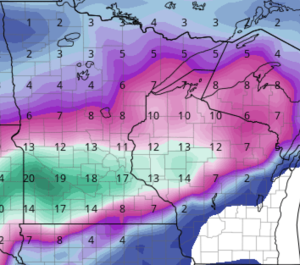 All signs point to a potent storm affecting the Upper Midwest in the middle of next week. The question is exactly where it will produce snow, and how much (actually, that’s always the question). 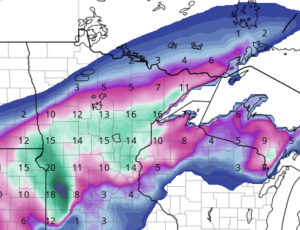 Right now, models range from a few inches to upwards of a foot. A foot of new snow would go a long way towards calming the nerves of some Birkie skiers. Then things get … interesting. There’s extreme, unprecedented heat in the arctic this year and weather patterns are not relatively well behaved. 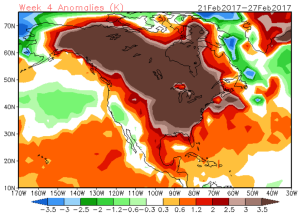 Several models—the US model in particular—have been toying with a huge ridge building over the western two-thirds of the country in the third week of February. This could bring a prolonged period of well above-normal temperatures to the Upper Midwest. This is still well out in the future, although the longer range outlooks are not pretty. Having said that, there’s a lot that could mitigate this. First, it’s more than 10 days out on the models, what meteorologists sometimes call “clown range.” Second, it looks relatively dry, which could mean above-freezing days, but below-freezing nights, which would at least mitigate snow loss. Third, it appears that the heat may break before the Birkie, so if the snow lasts, the race could go off in more suitable conditions (i.e., no water skiing on the lake). Fourth, the axis of the ridge has been wavering east and west recently on the models. Some runs, it winds up centered over the Upper Midwest, and in others, it shows up much further west, over the Rockies, with colder air in place over Wisconsin. So there’s a lot to watch. I wouldn’t get too worried yet, but if it doesn’t snow next week and the warm air pushes in, we may have a problem.